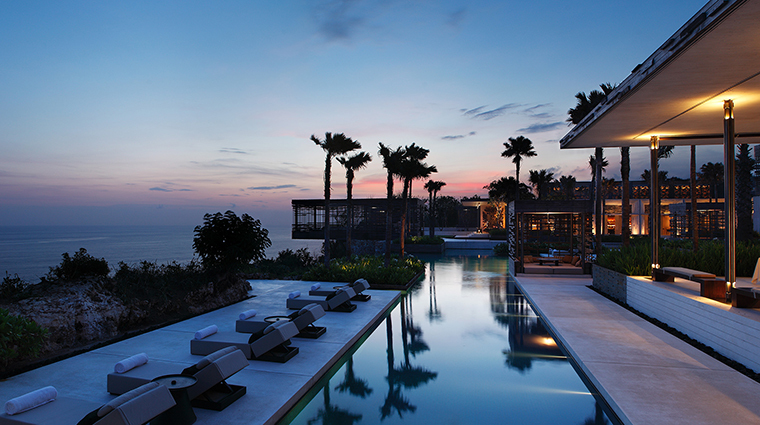 One of Bali’s very own landmarks, Alila Villas Uluwatu has received much praise for its architecture and its quality service. 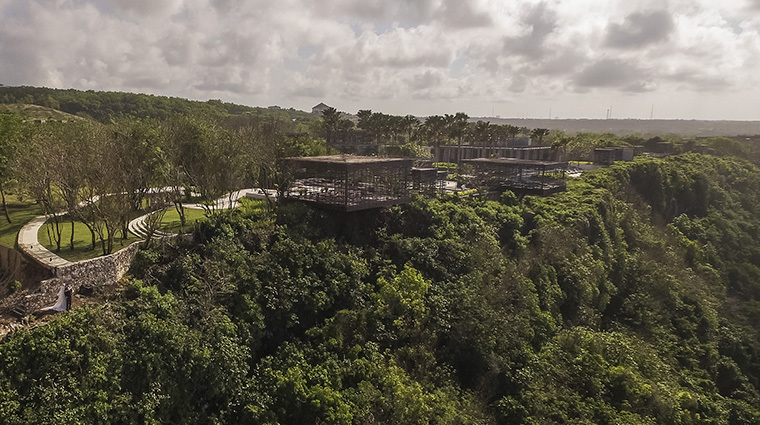 Perched high in an elevated plateau at the southern coast, this prominent luxury resort sprawls across 35 acres by the cliffside of Uluwatu, which is renowned for its magical sunset. 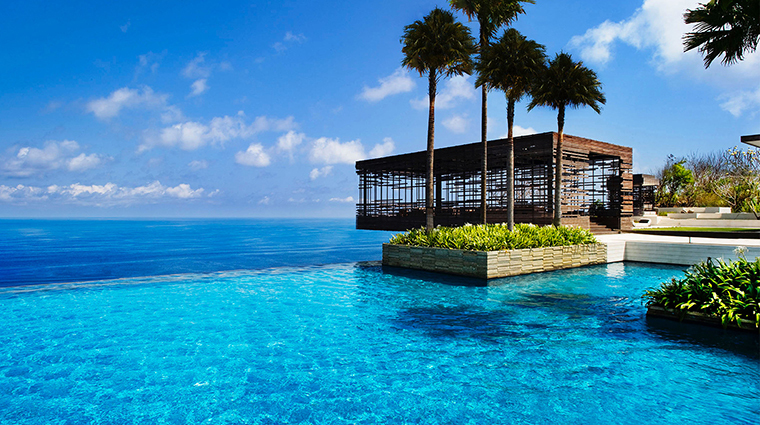 Designed by Singapore architectural firm WOHA, the resort’s architecture delivers the wow factor. 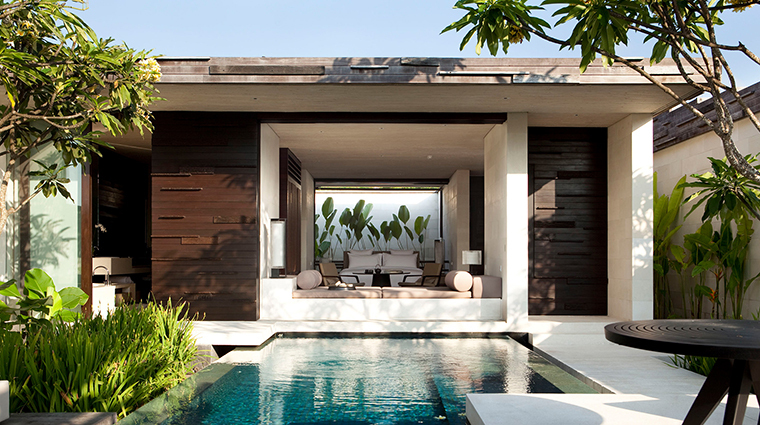 Its uber-chic design blends the contemporary style with Balinese charm without being cliché. Upon entering the resort, the lobby leads its way to an open space where all the public amenities are located. You’ll find the spa, boutique, three restaurants overlooking the Indian Ocean, the resort’s famous sunset cabana, as well as its signature 164-foot infinity pool by the cliff’s edge. 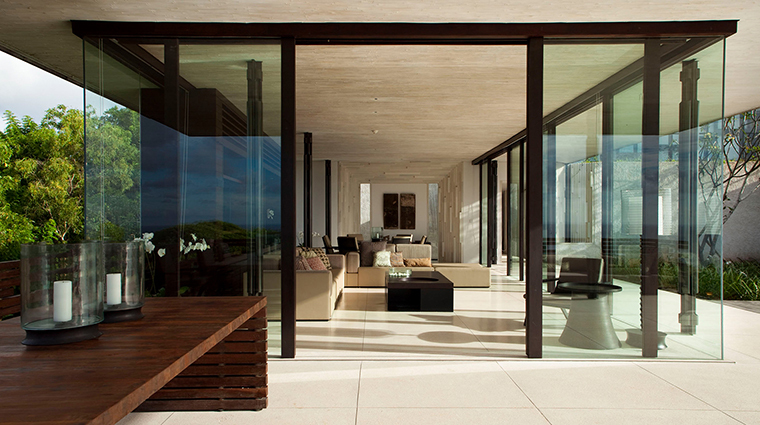 Meanwhile, the villas are located in a quieter area, thus allowing more privacy and serene living. They have a flowing design that connects the inside with the outside area seamlessly. Every one comes with its own pool, outdoor pavilion, a soft bed with luxurious linens, an indoor and outdoor rain shower, a bathtub, and specially blended bathroom amenities. 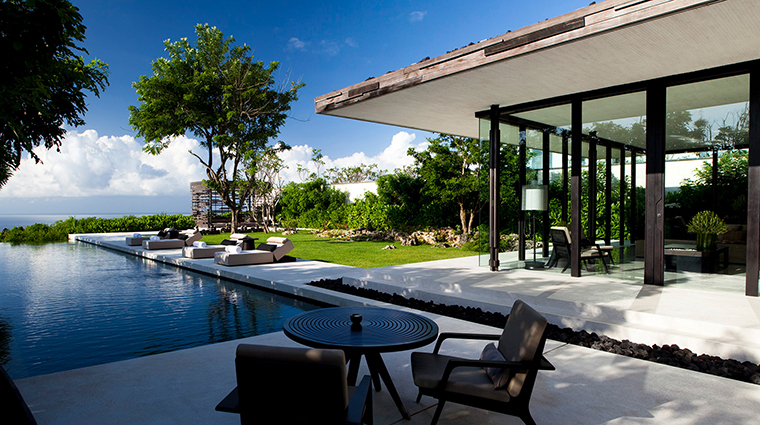 A villa host or butler is also assigned to every villa, and the level of service can be set according to your needs. 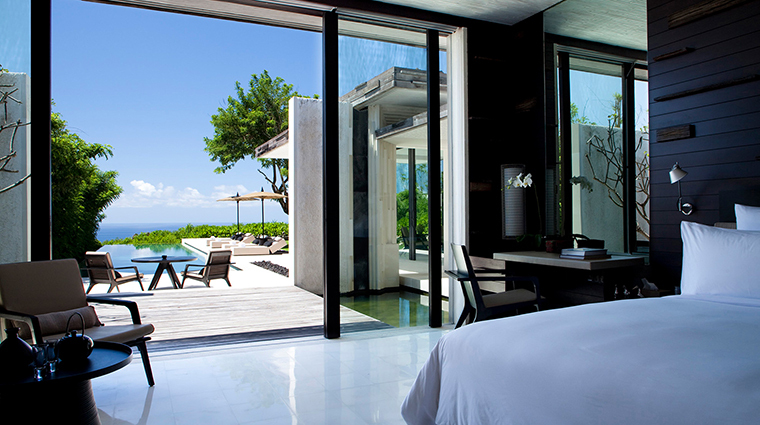 Beyond luxurious living, Alila Villas Uluwatu is an eco-friendly resort that adopts environmentally sustainable design and EarthCheck operating standards. 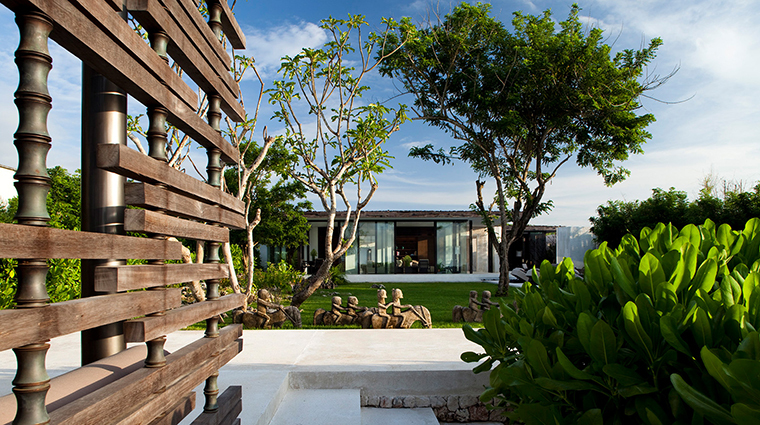 While the building used recycled materials such as wood from railway sleepers and telephone poles, the design of each villa also puts the sustainability principle into practice with the use of lava rock roofs, bamboo ceilings and elaborate window placements to encourage airflow and minimize the use of lights and air-conditioning. Nothing is spared when it comes to comfortable luxury stay at the Bali hotel. The heavenly soft bed uses 300-thread-count Ploh linens and duvet. The his-and-her vanity area in the bathroom uses different special blends amenities for each. His products are made with lemongrass and black pepper, while hers has mandarin, lemongrass and rose geranium. 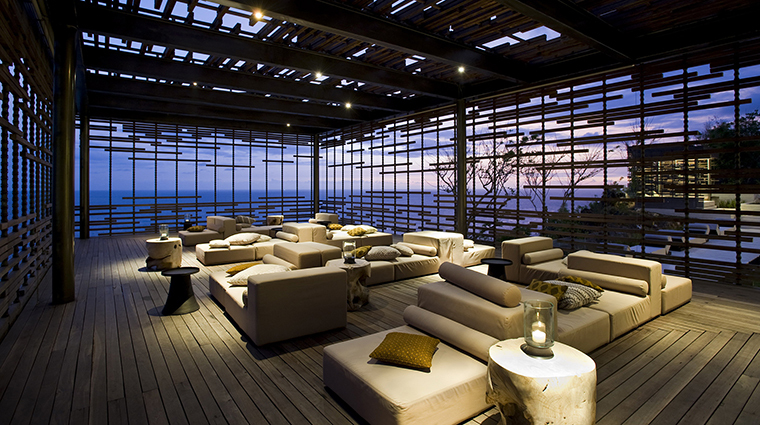 Enjoy Alila’s bespoke selection of cocktails at its sunset cabana. Among the most-photographed spots in Bali, the striking cabana dangles off the cliff and is the best place to enjoy the stunning sunset of Uluwatu. 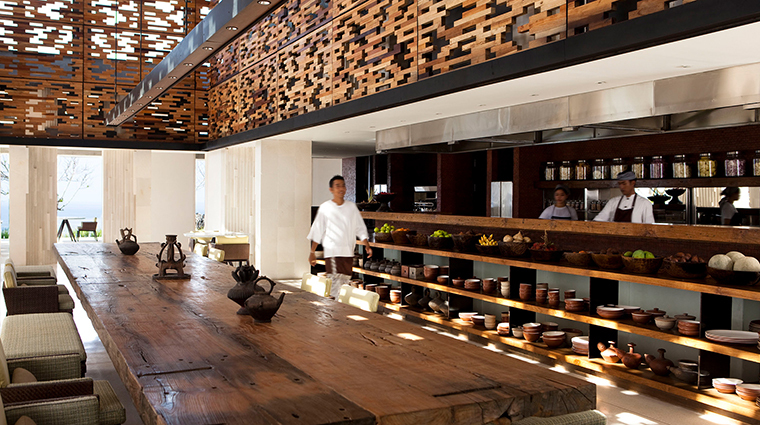 The service at Alila Villas Uluwatu is top notch. The staff is omnipresent, yet not intrusive or overbearing. 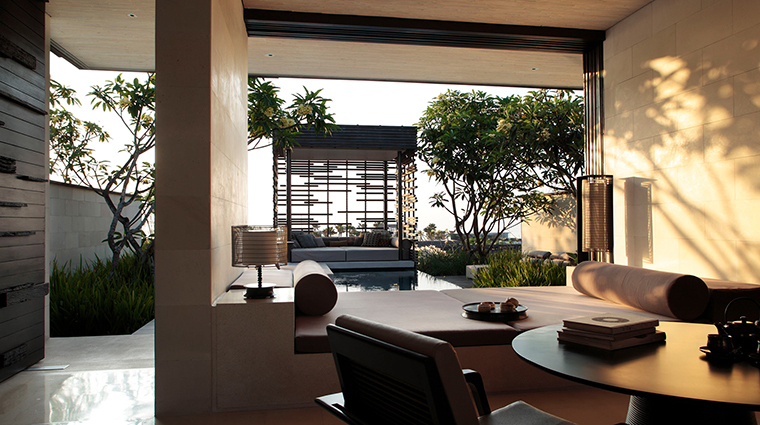 Spa Alila is one of the best on the island. Try the Journey Beyond Two treatment, which is great for honeymooners. It allows couples to learn basic massage techniques, which then can be put into practice by giving your partner relaxing head, back or foot massage that will spark more intimacy during the holiday. You must dine at Quila. 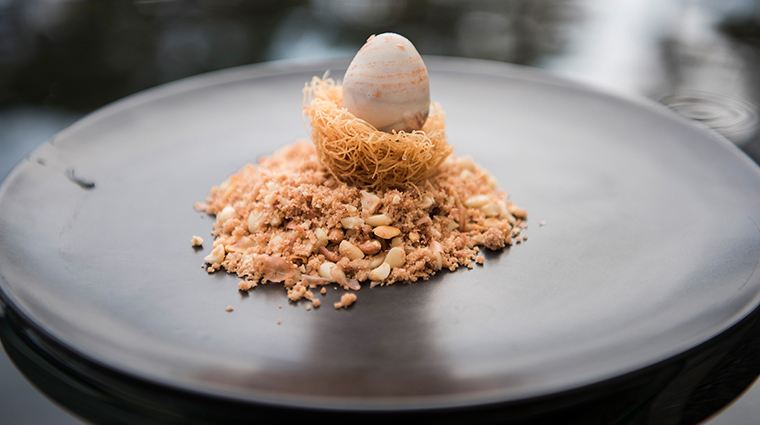 This new restaurant at the luxury hotel offers a multi-sensory dining experience by chef Marc Lorés Panadés. 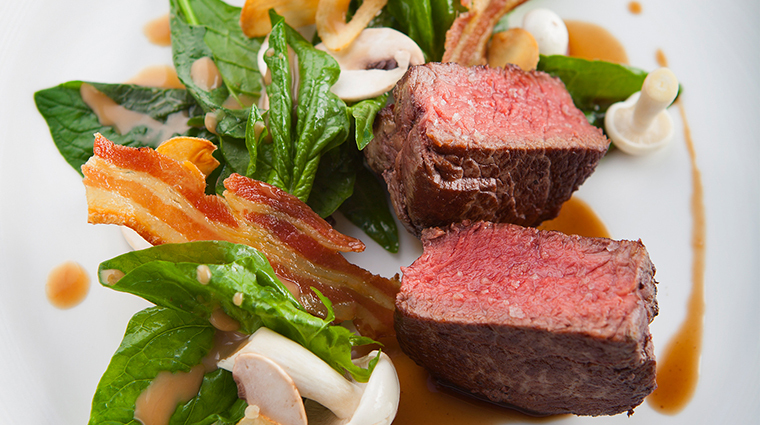 The menu changes daily, and every meal is a surprise and a delight. Although all one-bedroom pool villas feature the same layout, choose the villa at row four for the best view of the Indian Ocean. Select your own preferred type of butler based on the level of service intensity. Each villa comes with an assigned 24-hour personal butler with a choice of private, discreet and indulgent service options. Surfers should try the stand-up paddleboard yoga. Being so close to the major surfing spot in Uluwatu, the spa organizes SUP yoga that combines the balancing act of surfing with asana yoga. All practice is performed on top of 10- to 12-foot-long surfboards at the resort’s infinity pool. The Shirodara treatment at Spa Alila is simply the best. This 5,000-year-old Indian therapy combines four-hand massage with the healing power of warm medicated oil for deep relaxation. 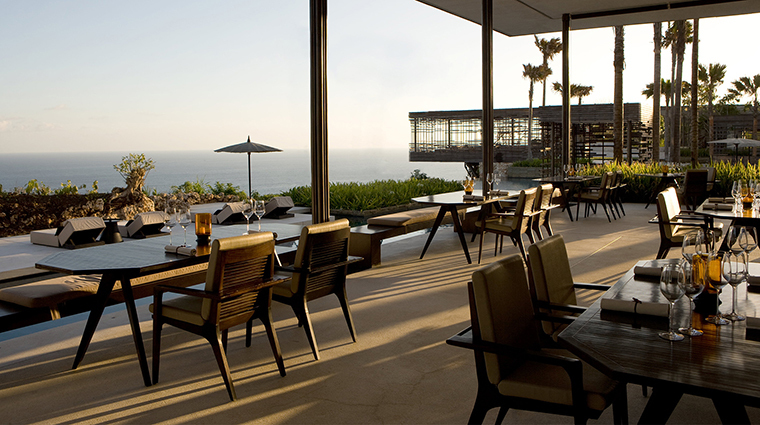 The romantics should set up a private dinner at the resort’s cliff-hanging cabana with the view of golden sunset. 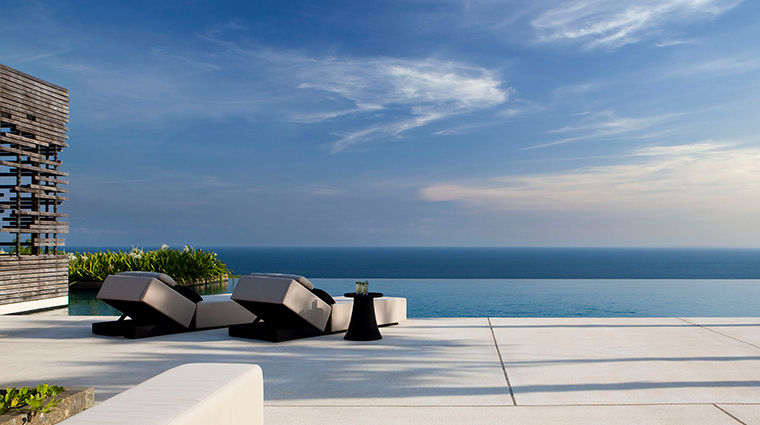 The accommodations range from one-bedroom pool villas to three-bedroom cliffside pool villas. The villas are massive. The one-bedroom option spreads across 3,132 square feet with a full-size private pool, an outdoor pavilion, a gigantic plush king-size bed, indoor and outdoor dining areas and a Jacuzzi bathtub. Unlike the traditional resort’s room, the smart open-plan design of the villas flows seamlessly from the indoor to outdoor. It allows the gentle sea breeze to drift in freely. 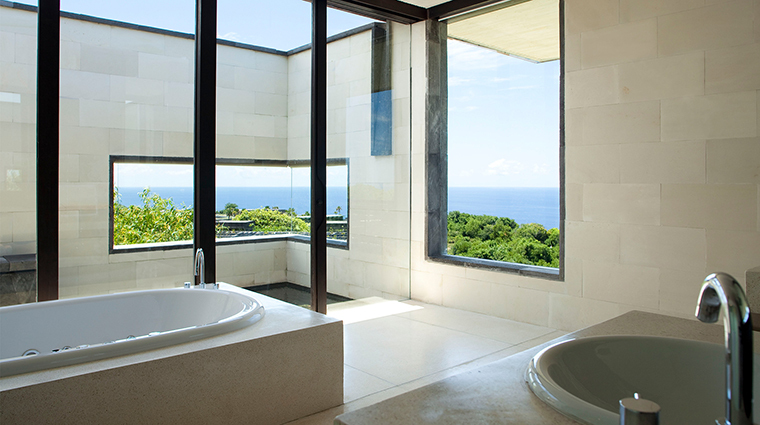 From the bed to the bathtub, every view is open to the outdoors. 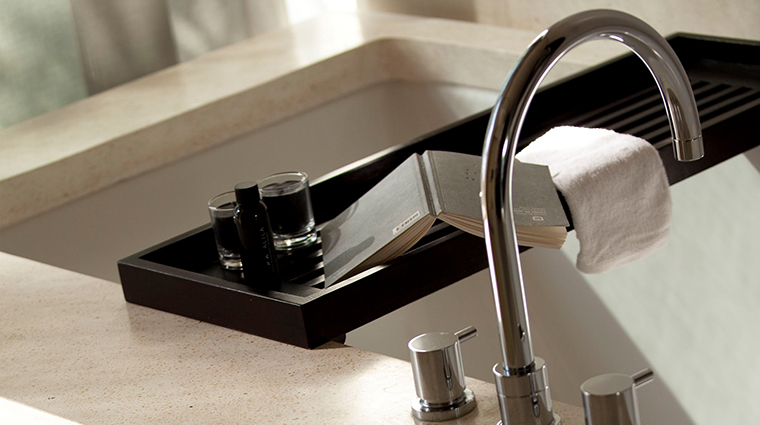 The bathroom amenities are top notch and set for ultimate indulgence. The separate his-and-her vanity area features its own amenities, while the tub comes with a special pamper box containing everything from bubble bath to face masks and handcrafted beeswax candles, all of which come in Alila’s signature secret scent. All rooms are equipped with oversized LED TVs with satellite channels, a DVD player, a safety deposit box and an espresso coffee machine. The dining options are plenty and first rate. 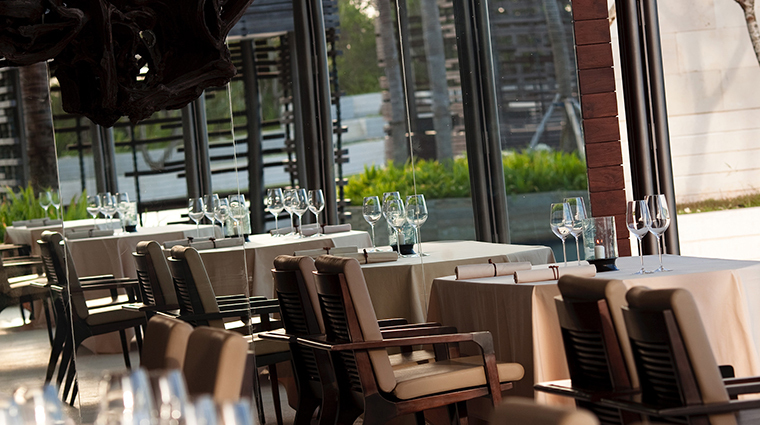 The Warung serves authentic Indonesian and Balinese delicacies with indoor and outdoor seating overlooking the ocean. Dishes arrive with a complimentary spread of eight different kinds of sambal (chilli paste), a flavorful local touch. 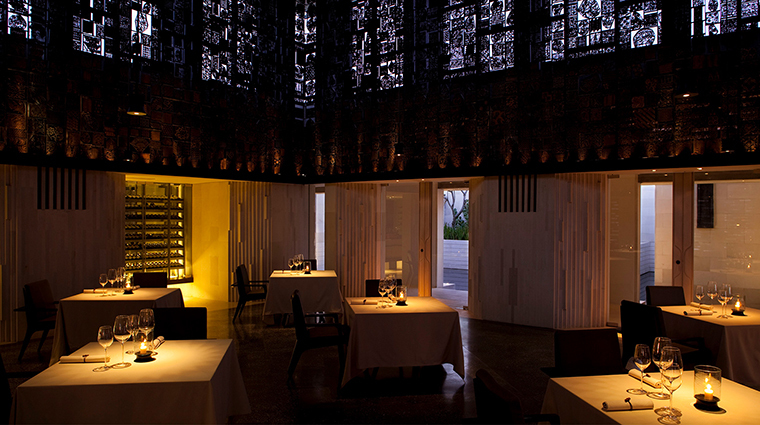 One of the hottest new restaurants in Bali, Quila brings you on a gastronomic journey with its multi-sensory surprises. The restaurant only host 10 guests each night with a chef degustation menu that combines Mediterranean-inspired creations with local produce. Cire whips up gourmet comfort food that dips into Asian and international cuisines. There’s a specific menu for locally produced and organic dishes that range from starters to desserts. Try its acorn-fed Iberico ham appetizer. The sunset cabana is the perfect place to enjoy sunset cocktails and snap those Insta-genic photos. While you admire the vista, sip the Rujak cocktail, which took its inspirations from Indonesia’s sweet and sour fruit salad. 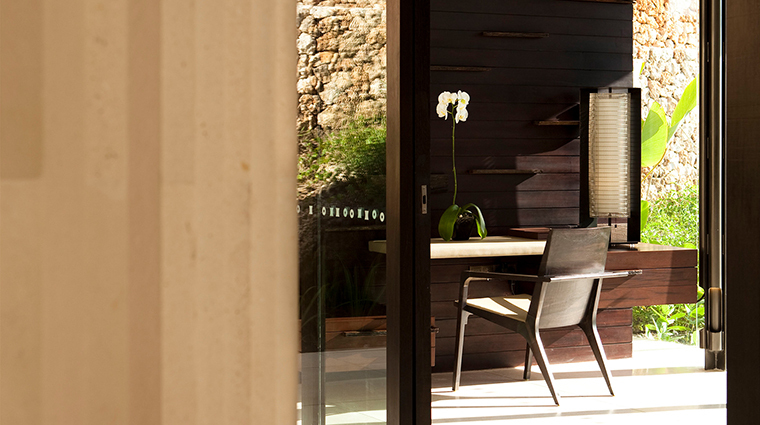 Breakfast can also be arranged at the privacy of your own outdoor pavilion in the villa. The amazing spread is filled with many chocolate delights, including chocolate croissants and chocolate sandwiches.